If you experience inflammation after eating eggplant, you most likely are allergic to the vegetable. 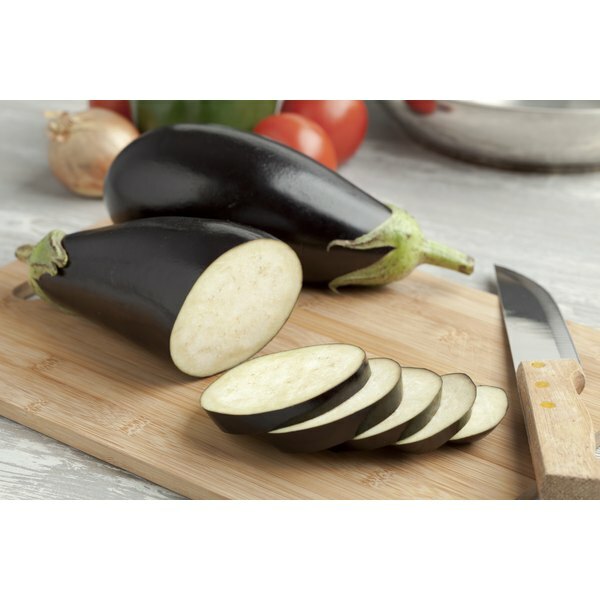 Eggplant is a part of the nightshade vegetable category, which includes tomatoes, green peppers and potatoes. Although an allergic reaction to eggplant is rare, you may experience mild to severe symptoms shortly after eating eggplant. If you develop any adverse reactions after consuming eggplant, call your doctor immediately. Food allergies typically affect children, but can affect anyone at any age. The most common foods that cause an allergic reaction, according to MedlinePlus, include: fish, eggs, nuts, milk, peanuts, soy and wheat. There is no cure for a food allergy, but the condition is manageable. If you’re allergic to eggplant, your body’s immune system malfunctions every time you eat the vegetable. The proteins in the eggplant are mistaken by the immune system as a harmful substance. The body reacts by creating a defense system that includes antibodies and histamine. Histamine is a chemical in the body that helps to protect it from infection, but can lead to inflammation and irritation in soft tissue. The effects of the triggered chemicals in the body causes minor to severe inflammation in soft tissue throughout the body. Inflammation commonly develops in the sinuses, the digestive tract, the lungs and the skin. You may experience difficulty breathing, wheezing, diarrhea, vomiting, stomach pain, cramping, nasal congestion, sinus pain, post-nasal drip, hives, eczema or other rashes, according to MedlinePlus. In rare cases, an allergic reaction to eggplant can lead to anaphylactic shock, a deadly condition. The American Academy of Allergy, Asthma and Immunology states that during a severe allergic reaction the body creates excessive amounts of histamine that causes severe inflammation throughout the body. Your body can quickly experience a state of shock, increasing your heart rate, dropping your blood pressure and restricting your ability to breathe. If you experience any of these symptoms, call 9-1-1. Treating an allergic reaction to eggplant begins with proper testing and a diagnosis. Avoid consuming foods that contain eggplant. If you accidentally ingest eggplant, minor inflammation may be treated with an over-the-counter antihistamine, according to Food Allergy Research and Education. Skin inflammation can be treated with steroid-based creams, such as hydrocortisone.